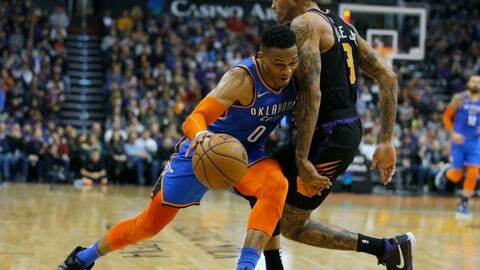 PHOENIX (AP) — For three quarters on Friday night, the improving Phoenix Suns gave Oklahoma City everything it could handle. Westbrook scored 40 points, 15 in the game’s final 6 ½ minutes, Schroder scored 14 of his 20 points in the fourth quarter and Oklahoma City snapped a two-game skid despite the absence of Paul George, who missed his first game of the season due to a right quad contusion. Abdel Nader scored a career-high 18 for the Thunder.